Despite its name, DestroyTwitter (free/donationware) is actually one of the most pro-Twitter apps out there. 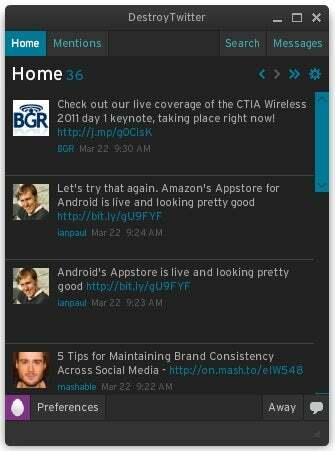 This lightweight, AIR-based desktop client is all about Twitter--and only Twitter. This laser-sharp focus helps keep the app's footprint small, but it also means it won't work for folks looking for a way to manage multiple social networks. Still, if you're looking to get the most out of Twitter, DestroyTwitter could be the app for you. DestroyTwitter keeps its footprint small by focusing solely on Twitter. You get pop-up messages that alert you to new tweets--and these can quickly become overwhelming. Luckily, DestroyTwitter recognizes that, and lets you disable them if you prefer. In addition, you can choose where the pop-ups appear, and can change the notification sound to one that better suits you--or to no sound at all. DestroyTwitter's customization features don't end there. The app lets you do everything from changing the font size to adding a new theme if you don't like its current look. If you want to filter out certain users and hashtags, you can do that, too. And if you're sick of receiving Foursquare and Gowalla location-based updates, you can filter them out. While DestroyTwitter makes it easy to take advantage of Twitter's features, it doesn't offer much in the way of analysis tools. If you're looking for statistics on your tweets, you won't find them here--you'll have to opt for a product like HootSuite instead. What it does offer in exchange is a small footprint and uncluttered interface that lets you use Twitter the way you like it. If that's enough for you, you'll find DestroyTwitter to be an excellent Twitter management tool.